Kathy: Hi, everyone. Kathy Caprino here. Mo: I’ve got one of my favorite people here visiting us, Doctor Neha Sangwan. 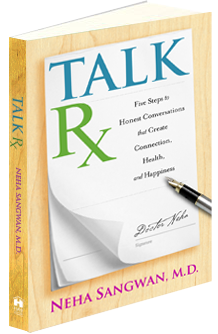 We’ve been getting as much expertise as we can out of her since Doctor Neha’s book came out, Talk Rx: Five Steps to Honest Conversations that Create Connection, Health, and Happiness. I can’t get enough of your expertise, Doctor Neha, with the mind-body connection through knowing our body better. It’s like we’ve got our own radar system. Kathy: I want to hear so much more about the idea of the healing conversation, that as a doctor you noticed that what’s at the root of so much chronic illness is not having the conversation we need to, so can’t wait to talk all about this. Mo: Kathy and audience, Doctor Neha and I met each other a little bit over a year ago. Doctor Neha was getting ready for her book launch with Hay House. I was trying to shift my message more toward career stuff. She and I hit it off, because she’s a doctor, I’m a nurse, and anytime you find your fellow healthcare practitioner we gravitate to each other. I loved the fact that she was speaking so authentically about the mind body connection, something that frankly the institution of medicine doesn’t totally get on board with a hundred percent of the time. I devoured Doctor Neha’s book. Love her stuff. Love a lot of the techniques that she has in her book. Mo: Doctor Neha, one of the most intriguing aspects of your medical expertise, because you’re astutely a physician caring for the best health of people that you’re working with, both in corporate settings and in all of your conferences and keynotes that you give. I’ve had MRIs. I’ve had CT scans. I’ve gone into these big tubes with big magnetics and all kinds of ions zooming around trying to see what’s going on with my body, but you have a fantastically authentic, natural way to walk us through getting in touch with what’s going on with our body. Can you tell us a little bit about that? Doctor Neha: Sure. I call it a body scan, and you’re absolutely right. It’s a different kind of body scan. It’s using breathing as well as something called guided imagery to bring you from the top of your head to the bottom of your toes to slowly pick up clues that you never noticed were even there in your body. Those will help you in communication as well. Taking a nice deep breath in and out, allow gravity to pull your shoulders down and feel the ground beneath you, the chair beneath you, or couch, or wherever you are, feel yourself supported so gravity can help pull you down. As you take a nice deep breath, bring your attention to the top of your head, around your scalp and your forehead. Allow yourself to become aware of any tension or if it feels relaxed. With your next deep breath, bring your attention around your eyes, your cheekbones, and your jaw. Also bring your attention to the base of your tongue, a place where people often hold tension without even knowing. As you take your next deep breath, gently moving down into your neck and your shoulders, notice if one side feels different than another or if they feel the same, often a place we carry the weight of the world. With your next deep breath, drop into your chest cavity and pay attention as your rib cage expands and contracts with each breath, protecting your heart and lungs all day without you knowing it. Then gently settle into your heart space. As you settle there, take a moment to remember all the kindness that you give to your family, your friends, your loved ones, even strangers. With your next deep breath, gently move down into your abdomen, allowing it to soften. This isn’t often a place we allow to be soft and relaxed, but when you soften your abdomen, the rest of the muscles in your body relax. So allow it to expand and take in air so deeply that your abdomen expands. Are there any messages your body has for you here in your hips, your pelvis, your abdomen? Moving down into your buttocks and your thighs, become aware of your legs. Does one feel different than the other? Are there any messages your body is sending you? Into your knees and your shins and calves, become aware as you gently move through your legs, all the way down to your ankles, your heels, and your feet. All the way through to your toes, become aware of what taking a few deep breaths and focusing on different parts of your body can do to change that your state of being. Notice how you are experiencing this moment. Do you feel any more or less relaxed as you do this? Then gently allow yourself to come back up through your legs and your abdomen, back up into your heart space. Take a moment to take all that love and appreciation and gratitude that you give to others in the world and shower that back on yourself. Pay attention and notice if it’s easier for you to give that to others over giving it to yourself. Gently deepen your breath, in and out, then wiggle your fingers and toes, bringing yourself back here in this moment. That’s your body scan. Mo: Wow, Neha. Thank you so much. I noticed my jaw had tightness when we were doing that scan. I’m trying to massage it out now. What’s up with that, Doctor Neha? What’s the jaw tightening? Maybe I should be insightful and tell you. Doctor Neha: You know, it can be different for different people. First of all, isn’t it interesting that just by slowing down a little bit you noticed that it was there, whereas before maybe you were powering through your day? Mo: I was powering [through my day]. Doctor Neha: For those of us who want to strive and accomplish a lot, jaw tightening [may reflect a thought like], Oh. No. No. I don’t have time for you. I’ve got to keep going. The most important thing is [to pay attention to it]. Let’s say you’re in a conversation and something surprises you or it doesn’t seem quite right. Jaw tightening could be one of those ways your body let’s you know, “Uh-uh. Got to say something,” or “Huh. I’m not sure if I’m ready to commit to that decision?” It’s different for every person, so I would ask you, what do you think your jaw tightening could be? Mo: I think my jaw tightening [means I’m] ruminating about a lot of things. I’m chewing on a lot of details in my life. That’s what I think it’s about. Doctor Neha: You would be right. I don’t argue with people when it’s their body talking to them. My job is to ask the questions and facilitate their own wisdom and guidance in what it could mean. That was great. Mo: Thanks for that awareness. Kathy: Can I throw something in there? Mo: Excuse me; I need to walk off the set. I got to make a phone call right now. Let me go have that difficult conversation I’ve been putting off. Doctor Neha: Another thing that could be happening is sometimes if people feel a tightening in their throat or a sensation of shortness of breath like, “Oh. I can’t quite get enough air in. I feel like I’m breathing a little shallow,” sometimes that can be communication issue. One thing I want to make sure as we start talking about physical sensations is that we definitely advise that everybody see their doctor first. You have jaw tightening; you have a problem there; you have throat constriction or inability to breath. The first thing you do is get a clear bill of health. Then if [the doctor] tells you, “Oh, yeah. You’re fine. There’s no problem. Nothing’s wrong,” and you know you’re not fine, that’s when you need to start paying attention to what else this could mean. Mo: Well, you know what? I just realized what’s on my jaw. Mo: I had a few little skin lesions removed last week. I was at the dermatologist. When she removed one of them on my arm she saw one that was pink. She said, “Oh. I’m concerned about that one.” The way that she zoomed in on it, and I thought it was nothing, terrified [me]. Honestly, now that I’m able to stop and get into this I think I’m fearful of what’s going to come back about that [spot]. Doctor Neha: It really is powerful. Mo: I didn’t even realize it was bothering me that much, but it is. You tuck it back there. You know, you shove it back in the back of the jar to not talk about, not think about. Doctor Neha: Great question, Kathy. Kathy: Thank you. For those of you who followed my stuff, you know briefly I had four years of chronic tracheitis. That’s what they called it. It was excruciating. The worst thing is I am a singer and a speaker, and I couldn’t speak. Nothing came out. Doctors said, “I don’t know what it is. Here are your antibiotics.” Everyone knows what antibiotics do to women’s bodies. It was a disaster. Finally, I went to an energy healer. I walked in, and the first one said, “What do you do for a living?” She said, “This is a crying within. You are not speaking truth.” I didn’t like that answer, because I made a lot of money, so I went to another energy healer. She said, “What do you do for a living?” I said, “Oh, no.” She said, “Yeah. You are lying. Every day you’re not being authentic. It’s infecting you.” I want to tell you from the day I was laid off, one month after 9/11, I’ve never had tracheitis again. In my own book, Break Down Breakthrough, I have a chapter on healing chronic illness. Of course we’re not saying, “Don’t go to the doctor.” We’re saying there are often metaphoric, spiritual, or emotional underpinnings. Right, Neha? I think that’s what your whole world is about. Doctor Neha: Absolutely. Sometimes a physical ailment is physical. Sometimes you get in a car crash, and you just broke a bone. But I believe, even when someone comes in with a heart attack, or a migraine, or pneumonia, something is happening on nearly every level. It usually shows up in the physical realm, and that’s when it really gets our attention, but usually something else is going on in the background and it’s been undermining their immune system. We know that stress causes or exacerbates more than ninety to ninety-five percent of all illness. If we know that, we need to figure out what’s at the root of all that stress. Mo: You have some great questions that you begin asking, Neha, in the hospital. I love when you go through these questions. Just pick one of your examples, because they’re all brilliant. You have some great examples from your book. Kathy: Right. Someone told me there’s no such thing. They didn’t know what the heck it was, so let’s call it that. Doctor Neha: Same thing with blood pressure. Right? We call it idiopathic hypertension. Ideopathic means we don’t know the cause of hypertension, your blood pressure. Okay? Your blood pressure’s high, and we don’t know the cause of it. That’s what that fancy word is. The medical system has a fancy language. Sometimes it doesn’t say as much as these questions will reveal. So you’re your tracheitis, and I would have asked you these five questions as an Awareness Prescription. You say whatever comes to you. Kathy: Okay. I’m going to put myself back then when I was so miserable. Doctor Neha: Yeah. Back then. The first question is why this? Why are you suffering in this particular part of your body, that part that allows you to breathe and speak? Kathy: Truthfully, I don’t think I had the awareness to know it was because I wasn’t speaking up, but what I think I would’ve said is I don’t feel heard. I’m going to cry. I feel like an impostor. I don’t feel valued for who I really am. Listen to how it makes me cry after fifteen years. I’m not me. I have to pretend. I’m going to lose my voice right this minute. Doctor Neha: Because you know how hard it is to pretend to be something or someone else. Kathy: For me I was called pathologically authentic years ago. I mean, I have a tendency to be pathologically authentic. For me to be a liar, it’s unbearable. It is a true crisis for me. Doctor Neha: We want to be loved, and there are strategies we develop to get love from society, from our families, from our siblings, to be recognized and heard. We don’t even know we’re not living our own life. We only know what worked for us as children. Then we use it as adults, but it’s actually not authentically us. Mo: Kathy, when you were just being authentic there and really opening your energy up to that pain of recollecting, I felt an energy shift. I’m wondering if perhaps that wasn’t another wave of healing for you on it. Kathy: Thank you for that. It’s really interesting. I just published a wonderful interview with Deepak Chopra, which was life changing just to do it. I heard from someone from that painful past. It’s still painful. I’m not healed. Doctor Neha: You know, it’s an ongoing process. You heal different layers of it. Honor that. I got the goose bumps. For me goose bumps come whenever something just seems true. Kathy: Thank you for that. I just had an energy healing session. Doctor Neha: That’s only question one. There are four more. Kathy: Shall we hear more? Doctor Neha: Question two is why now? Why at that moment in time was that happening? Why didn’t it happen a few years earlier? Why didn’t happen a few weeks later? What was actually going on in that moment that your body needed to get your attention? Kathy: My children were little, and there was an urgency that if I wasn’t going to be with my babies, I better damn well be doing something meaningful and purposeful and positive. Holy cow! Kathy: Why didn’t someone ask me this fifteen years ago? Mo: Kathy, is that a revelation? Kathy: Yeah. Massive. Really wonderful. Doctor Neha: All right. Question number three. Now, since hindsight is 20/20, what signals might you have missed along the way? Kathy: Well, being sick for four years, every three months. Doctor Neha: The same part of your body repeatedly getting sick. Kathy: That’s it. The unbearable stress. The leaving my little baby, who was three years old, with a nanny. The nanny hadn’t emerged from her room yet, and I would have to leave my child in her high chair to catch that blippity blip train. The whole thing was excruciating. There were a hundred signs. As we know, the body says what the lips cannot. I didn’t want it not to work, because I made a lot of money. Mo: Because you wanted your career. Absolutely. Kathy: I see this in all my coaching with women; we want it to be right. We want it to be fixed. Mo: Because it’s supposed to. It’s supposed to work out okay. Kathy: There were other things that were great about it. Doctor Neha: What you’re really speaking to, Kathy, is the price versus the payoff. Humans keep doing whatever they’re doing as long as the payoff for them in that moment is greater than the price. As soon as the price exceeds the payoff, that’s when someone’s ready to make change. Kathy: Doesn’t that mean, and I always say this, you don’t have to have a crisis. Don’t wait until the crisis hits, but I find that’s what humans do. Do you find that, that we don’t really make the big change until that price is too great? Can we change that? Doctor Neha: We absolutely can change that. I would have to say as a hospitalist I was a doctor who took care of people once they were admitted to the hospital—heart attacks, strokes, pneumonia. I wondered why every single patients of the thousands that I asked these questions to always knew why they were sick and was always willing to do this awareness prescription with me. Now I know why. Every single one of them was in the physical crisis of their life. Kathy: They’re going to be open to anything that will help. Kathy: What was the answer to that? Mo: That is the most powerful question. Kathy: Why is western medicine so …? Doctor Neha: I gave a very unintelligent answer. I said, “Because they pay me to clean up the mess after. They don’t pay a doctor to go out when people are well and take care of them.” After saying that for about seven years, I sat down and thought, That is the most ridiculous answer I have ever heard. The truth was I was too scared to go out and forge that path. That was the truth. When the price of me being there exceeded the payoff of security and stability, that was the day that I left. I decided I would be that doctor. Mo: Did that show up in your body, Neha? Kathy: Can I ask you this, Neha? Kathy: You may not want to take this on, but I’m very careful whom I use as my medical service provider. They have to spiritually and energetically make me feel good. Why are so many highly trained, brilliant physicians in opposition to the idea of what you’re just talking about? Why? Why do they resist it? Doctor Neha: I’ll give you my experience of being a physician with my colleagues. 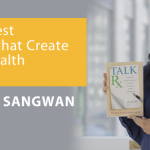 I’ve trained thousands of physicians now through Kaiser’s system and other healthcare systems. We’re the toughest ones. I would say that many things contribute to it. First, I had to be right on countless multiple-choice tests to get here. I had to take sixteen hours of testing multiple times in a row and score well in order to get the next level of training. As we’re all competing with each other, we’re very autonomous, because it was competition. Then by the time we get into the healthcare we finally “succeed.” And then it’s like, “Okay. Now play nice on a team,” except we’re now thirty years old coming out of residency and you’re telling me to do the opposite of what made me successful. Mo: And you’re living from your throat up. There’s nothing that’s going to benefit you as a doctor that’s below the voice box, like nothing. Doctor Neha: In fact I had to shut out my body to endure that length of training, 36-hour shifts on call. My job was to check out of my body so I could be in service to others at any moment. Mo: It’s almost like institutionalized ignorance. Mo: It takes that to break through the pre-cognitive wiring that you just talked about, Doctor Neha. Over years and years of test-taking and being smart and being given recognition and ranking in the class, those neuropathways are hardwired for A + B + C + D = I know the fricking answer, and I get high marks. Doctor Neha: I get an A.
Mo: Right. This is how I identify myself. I can [figure out] what’s wrong with you, what’s wrong with you, test, test, test, equals the diagnosis. Here’s the treatment. Don’t challenge me, because I’ve been right on tests for thirty years. Kathy: Also energy is not black and white, like Neha said, “Well, Mo, what do you think could be happening with your jaw?” I’m not bashing the medical profession, but there’s some narcissists there, and the idea that Mo might know better than the doctor what is wrong [with her] flies in the face of some experts that want to be experts. Do you think? Doctor Neha: Instead of maybe my method wasn’t congruous with what they [need]. Maybe they had a different idea. Maybe this didn’t really work for them. Maybe another round of chemo is not the answer. I find that to be an interesting and important angle in medicine: how have we gotten here? What are the behaviors and the schooling and the institution that lead us here? Then how do we as physicians grow and expand outside of the book knowledge we have been given? Kathy: Could we clone you? Could we have ten million of you? You times a million would change this world. Doctor Neha: Aw, thank you so much. Mo: Maybe we only need a hundred of her. Doctor Neha: To me, this was my service work. This was the way that people didn’t have to come to see me in the hospital in order to get this information. It took me three years. You know, I ended up selling my house and everything to launch a PBS show and a book and a platform. It was a big deal for me. In this process it felt like, Okay. This is how you take it out of it needing me, and take it into the hands of however many people are interested. Kathy: That’s what I call scaling transformation. You found the way. Doctor Neha: Well, one of the ways. I believe it’s all of us. There’s a group of us. Everywhere I go I meet more and more of us who are working to change healthcare and the world, working to help women move on to their soul’s true calling and path. To me we’re all tea lights in the world, and we can’t help but become a fire soon. Mo: That is! I just opened up to your lovely book to “Love and Gratitude,” chapter eighteen. The book just opened to love and gratitude as Kathy and I are feeling such gratitude for your talents and your ability to synthesize, Doctor Neha, the importance of how the energetic body gets stuck in the physical body. How do you envision this work changing or transforming healthcare? What are you doing right now to influence and change the healthcare landscape? Doctor Neha: That’s such a big question. I’ve thought of it on so many levels. I want to work with CEOs of corporations, because they make the decisions and leadership teams, because they make the decisions that affect and influence thousands of people. Then I’ve thought about it on a level with the doctors and nurses and change healthcare teams, because that’s where care is given. Then I thought that seems so incredibly overwhelming, so why don’t I start with me? Why don’t I become the type of doctor, the human, the person who learns marketing and upgrades her website so that she can appeal to the people that she hopes hear the message.” What I ended up realizing was that if each of us took responsibility for ourselves, everyone in the world would be accounted for. Mo: That goes back to Gandhi’s statement, “Be the change you want to see in the world.” When we show up fully, when we are presenting ourselves to the universe as who we want to be and how we want the world to be, doesn’t the universe show up to meet us at that point? Isn’t that what you’re saying, Doctor Neha, that you decided, “I’m the one who’s going to show up with this message, and I’m going to present it, and I’m going to be as strong, and available, and as accessible as possible”? Doctor Neha: Absolutely. I also needed tools to speak my truth. Kathy, you had tracheitis, not because you didn’t want to show up as this incredible woman. You actually had competing intentions of being a mother and providing and giving security. It gets confusing. There are tools that help you figure out what you value most and find the courage to understand the signals coming from your body when you’re not getting the answer you need from the healthcare system or someone’s telling you you’re fine but you don’t feel fine because you’re up in the middle of the night, or you have migraines, or you have anxiety. One thing’s for sure. Your headache is not an Advil deficiency. Doctor Neha: We can numb [physical signals] for a little while, but that’s not getting to the root of what’s happening. For me, it was about understanding, How was I burning out? What was it that I wasn’t saying that I was blaming on other people in other institutions? It’s my job to get out there and change healthcare. For me, it was communication. It was teaching people the tools of how to live honestly and authentically. How do you know what that is? How do you find the courage to say it even when it’s scary? Mo: Isn’t that so much of what we hear in each interview that we do, Kathy, that the journey of the individual self and the journey through the threshold of our learning? Doctor Neha’s expressing that she was basically stuck—and not being authentic and being burned out and trashing her body and not speaking up. Kathy: My head is spinning. I have one wacky question. When you were talking what occurred to me is some of the most rewarding moments have been what I’m doing right this minute, which is highlighting other people’s brilliance, but I remember ten years ago a friend said to me, “You should be the host of a show like the ‘Aware Show’ in California.” I remember thinking, “I don’t want to be the host. I want to be the guest.” Oh, my god. It’s one of twenty million examples of my ego. For some reason I’m desperate to know what you feel the role of ego is in our sickness. Have you done work on that? Even when you said, “I wanted to work with CEOs. I wanted to work with physicians,” you finally realized, “Hang on. I’ve got to work on me.” That is the ultimate handing over of your ego. You are making an enormous difference in the world, but let’s start with me. It’s an ego thing that we have to let go of. Do you find that in your work ego plays a role? Doctor Neha: You know, it’s so interesting that you say that, because I do think that ego plays a role. I just look at it a little bit differently. I think of it as part of my DNA. I came into this world wanting to belong in the world. I grew up in an Indian immigrant family. They were very concerned about stability and security, and that I was an engineer or a doctor, or both. It’s all about science and math and education. They also wanted to belong to the Indian community that was here and to the American culture at large. My desire to become successful, whatever successful means, was measured by the external influences of belonging to society and the Indian community and my family. Sometimes when I get lost and I make what other people think of me matter more than what I think of me, that’s how ego gets in the way. I don’t usually call it that. I just call it competing intentions of me wanting to belong to what I think is the cool crowd or what society will love me for and give me. I get attention and recognition, and that’s part of being human, wanting to be valued and heard. Kathy: I’ve got tears in my eyes. That’s so accurate. Mo: When we break from that internal connection, that internal source, that’s when things go the wrong way. So important to stay in touch with the internal guidance system. Doctor Neha: People really beat themselves up about it, but I would actually say it’s a natural evolution, because we’re babies when we come into this world and we’re helpless. We depend on other people to feed us, and bathe us, and if we cry we find out that they come or they don’t. We are in a helpless position, so we learn quickly how to get the attention of others for our own survival. Doctor Neha: Then we get sent off to school and it becomes about belonging to the crowd. It’s almost like we plan for these needs to belong throughout our life. Then all of a sudden we’re in our twenties and thirties and it’s about, “Hey. How come you haven’t kept up your connection to yourself? How did I not have this relationship or this job work out? How did I fail at this thing? Wow. How did I lose my connection to my own heart?” Well, you had it in the beginning. It’s just that you’ve been through a lot. Mo: You needed to navigate the physical world that forces us to food, water, shelter. It forces us to get on a path of whatever we think that success will be for us, so we have to do the work in the physical world. We have to put effort toward an outcome. We do that enough and then realize that’s not all that there is. Then we have to go back and revisit the internal self, because that’s the next evolution. As I’m hearing you speak, Neha, and knowing all the conversations that Kathy and I have had with other beautiful people who have been on their journeys and who have been so generous in describing them for us, we must return back to the self and the source to feel that next level of fulfillment in life. It is one that has to be done without too much regard for the external parts of what we’ve learned for survival. You have to almost let go of that and disconnect from that in order to serve the next level. Kathy: I would love to add, Mo, that there isn’t much societal and cultural support and encouragement for that. Mo: You got it. That’s why it’s so convoluted. Kathy: If you want to be in a tribe, that tribe has a lot to say. Mo: About how you are and who you are. Kathy: I just did a post with Mike Rowe about the five damaging myths about blue collar labor. I live in a very affluent town. They don’t want their kids to be blue collar laborers, no matter what Mike Rowe says. There’s a lot of pressure not to listen to what you believe in. I share that, because I don’t want people to beat themselves up once again that, “Why [am I not] listening to my heart?” Because there’s a lot of pressure not to. Do you agree, Neha? Doctor Neha: I agree. I say it slightly differently, because I think we live in this world where society matters no matter what. We are going to function together. We’re going to live together. My job is to learn to listen to the sound of my own heart and let it be slightly louder than the voices of others so that I still am in society, and I can hear what they value, and I can honor that [and myself]. Kathy: If this podcast allows just one person to choose differently, it’s a warrior act really. I mean, Mo knows this. I’m working with bloodied wounded soldiers, and they are women in the workforce. This is how I see it energetically. To say yes to your own heart [and letting it be] a little louder than what you hear, that is an act of a warrior. Doctor Neha: I agree. You know what I realized. We never gave you the last two questions of that awareness prescription. Mo: Look how far we’ve gone. Doctor Neha: We told them there was five questions to the awareness prescription, so we should be fair enough to give it to them. Kathy: Let’s not be incomplete. Doctor Neha: Let me just do a quick review. Question one was why this? Why was this part of your body affected? The second one was why now? Why did it happen at that exact moment in time? The third one was, now that hindsight’s 20/20, what signals might you have missed along the way? The fourth question is what else in your life needed to be healed? Kathy: Immediately, [I’d say] a relationship. I had cut myself off from myself. That meant I cut myself off from everyone else. I was angry and furious and resentful that at forty this is what my life was. Doctor Neha: Do you see how clear it becomes to people? Doctor Neha: That’s amazing. Then, finally, question number five. If you spoke from the heart, what would you say? Kathy: I want a different kind of life, and I don’t know how to get it. Can someone help me? Doctor Neha: That’s it. I hope we start thinking about different kinds of prescriptions than the ones we’re writing to numb out people’s [physical] signals. Your body’s talking; the question is, are you listening? It’s giving you valuable information. What I wish we’d do instead of trying to go really fast and see a patient in seven minutes, I wish [medical professionals] would slow down and get curious when an ailment is not being healed by the treatment we’re giving. I wonder if it might be happening on a different level. I wonder if we could ask the right kinds of questions as healers, as coaches. Let the person across from us help us help them. Mo: Can you see why I fell in love with Doctor Neha? Kathy: Yeah. I’m right there with you. Love fest. Mo: Absolutely. You’re smart, elegant, compassionate, graceful. Doctor Neha: Wow. I love you two. I’ll come back anytime. Kathy: Where can people learn more, and what’s next for you? Doctor Neha: They can reach me at doctorneha.com. On that homepage if they enter their name and email, they can get this whole awareness prescription and the first twenty-five pages of my book immediately. Then I also give weekly video blogs, which are like a sneak peek of me working with a client. Clients come in and ask me a question. I have no idea what they’re going to ask me. In about ten minutes or less, we turn it around and give the viewers key learning, just like you, Mo, and I just did. That’s in podcast, video, and blog form for them. Right now the truth be told I am going to be traveling a bit this year. I’m going to take a little down time and some of my own advice. Mo: That’s courageous. You’re listening to your heart just a little bit more. Doctor Neha: I have to tell you, it’s a little uncomfortable for me not to have a jam-packed year when I’m booked every minute of every day. I’ve decided that that’s okay. I’m going to pull back, relax a little bit, and see what other opportunities show up for me. Kathy: It’s going to be transformational, no doubt. Thank you so much. Mo: Truly a pleasure, Neha, to get to know you again, to get to hear your beautiful gifts. We had some personally touching moments here, both of us. Thank you so much. Kathy: Thank you for my energy healing session. I love you. Come back again soon. Send me your questions — drop me a tweet at #AskDoctorNeha or write your question and comments down below.